There are many worthy organizations, but one of the best ways to make the most impact is in your own community. Like choosing to shop locally, giving locally helps small non-profits directly serve the needs of your community members. 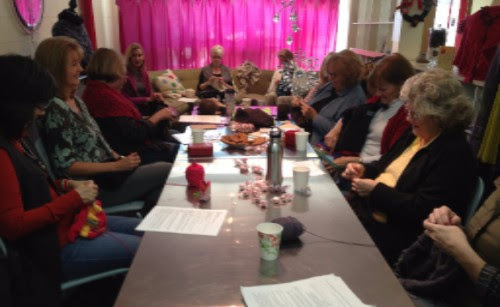 This Giving Tuesday, please consider making a one-time or recurring donation to Knitting in Recovery. Donations will go toward purchasing yarn, knitting needles, and crochet hooks for our clients, paying our teachers to continue administering kind instruction to our clients, and providing employment for a client at our storefront in the Pacific View Mall. Donations can also be made in someone’s honor and given as a gift. If you would like to donate, click here or follow the “Donate” link on the left-hand side of the blog. If you are making a donation in someone else’s name and would like the “A gift has been made in your honor” card seen above, please email emily@knittinginrecovery.com. Okay Ojai friends, this one is a two-fer! Find these scarves! We hid them somewhere around town. Once you find them, take a picture of yourself knitting the scarf and post it to Facebook or Instagram with the hashtag #knittinginrecovery . Be sure to follow us on Facebook and/or Instagram @knittinginrecovery to be automatically entered into a raffle for a yarn basket of your own. Hint: You can get a double-shot of espresso and knitting at this location! Once the scarf is finished, it will be donated to a local charity for our less fortunate community members. Posted on November 6, 2017 Author emilywagesCategories Casa Serena, Community Baskets, Help of Ojai, Knitting for Charity, Ojai Valley Family ShelterTags charity, community basket, community scarf, crochet, homeless, knitting, knitting in recovery, ojai, one stitch at a time, recovery, recovery is worth it, scarfLeave a comment on Find these Scarves! Another one for Ojai folks–find this basket! We hid it somewhere around town. Once you find it, take a picture of yourself knitting the scarf and post it to Facebook or Instagram with the hashtag #knittinginrecovery . Be sure to follow us on Facebook and/or Instagram @knittinginrecovery to be automatically entered into a raffle for a yarn basket of your own. Hint: Knitting this scarf will make you feel restored, and your appointment will be a breeze. Posted on October 27, 2017 October 25, 2017 Author emilywagesCategories Casa Serena, Community Baskets, Donations, Help of Ojai, Knitting for Charity, Ojai Valley Family ShelterTags charity, community, community basket, community scarf, crochet, donation, knitting, knitting in recovery, ojai, one stitch at a time, recovery, recovery is worth it, yarnLeave a comment on Find this Basket! We’ve got another Ojai basket in place! See if you can figure out where it is. Hint: If you come here, the rest of your day will be all booked up! Posted on October 26, 2017 October 23, 2017 Author emilywagesCategories Casa Serena, Community Baskets, Help of Ojai, Knitting for Charity, Ojai Valley Family ShelterTags charity, community, community basket, community scarf, crochet, knitting, knitting in recovery, ojai, one stitch at a time, recovery, recovery is worth itLeave a comment on Find this Basket! Got a case of the Mondays? Break up your routine by going on a scavenger hunt! This year, we’re expanding the Community Scarf Basket program to Ventura! This basket is at our first Ventura partner business. It’s a super cozy spot with lots of goodies for you to enjoy while you knit. Once you find it, take a picture of yourself knitting the scarf and post it to Facebook or Instagram with the hashtag #knittinginrecovery . Be sure to follow us on Facebook and/or Instagram @knittinginrecovery to be automatically entered into a raffle for a yarn basket of your own. The basket in its location. Do you recognize the mural?